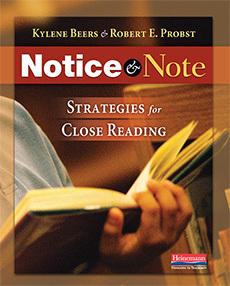 After I finished reading NOTICE AND NOTE, I challenged myself to look for the signposts in everything I read/viewed for the rest of the summer--children's books, adult books, movies, TV shows. I discovered that it's hard...at first. The way I was trying to capture my thinking was the first barrier I had to hurdle. I took a picture of the N+N reading log in Penultimate on my iPad and I tried to jot my thinking with the stylus my brother gave me. The image of the log kept moving around when I was trying to write. Annoying. There has to be a way to lock an image in Penultimate, but I wasn't patient enough to find it. Low tech was the way to go. I jotted the signposts on a scrap of paper that I used as a bookmark and grabbed some small sticky notes. Each time before I read, I glanced at the list of signposts. But it was still hard. I read more slowly and looked back at the signposts often, asking myself, Was that one? Was that one? Then, on page 19, I read, "Whit had heard the story a thousand times." and it was literally like a lightbulb: Memory Moment! Clear as day! At that point, I was able to relax into the reading and trust the author to lead me from signpost to signpost. Over the course of the book, I found all 6 signposts. At each one, I paused in my reading to think about what that signpost told me about the characters (alone or together) or the themes. I think I enjoyed the book more than I would have if I had just read it straight through, and I know for sure that if I sat down and had a conversation with someone about this book, I would, using my notes, have lots to say that I would never have...um...noticed or noted if I hadn't used the signposts. This is only my first experience using the signposts, but it makes me super excited to teach the signposts to my fifth graders and watch what happens to their ability to write about and talk about their reading. There is one additional signpost that I will teach my students. One I have learned to notice and note on my own -- the signpost of The Storm. So often, a storm in the story mirrors or foreshadows the action in the plot (change or trouble). First of all, how did I not read this book last year when it first came out?!?! All I can figure is that it got lost in the shifting sands/priorities of my TBR pile. If you missed it, too, get a copy and read it! These are characters you will love! Whit has lived his whole life within the confines of the zoo where his mother is the director and his father is in charge of the elephants. He has been "home schooled" and nannied there. He craves change. Whit meets Stella, a daily visitor to the zoo, and begins to learn about friendship in his first interaction with a member of his own species who is also his own age. Stella needs change in a way that is far more desperate and necessary than the change Whit seeks. Both characters have parents who don't understand them, but just as their need for change is very different, the level of "bad" or BAD parenting that each character experiences is quite different. Throughout the book, facts about zoos and zoo animals are woven. I wish I had read this book when it first came out. I could have handed it to my student who was almost exclusively a nonfiction reader in fourth grade and for whom TIGER RISING was his first independent grade level appropriate fiction novel. He would love the blend of fact and fiction in this book. He would likely also benefit from Whit's musings on what Stella's facial expressions meant, and the times when Whit came to realize that Stella was joking with him. Ah, well. Better late than never! I'm sure there are students who will be in next year's class who will enjoy imagining a life spent within the walls of a zoo. Cannot wait to dig into this post when I have more time. LOVE it. I am not done with N and N yet, but working through it. THANKS, ML. I did an interview for Jone M. on Wed. Did you see it? Almost mentioned you! 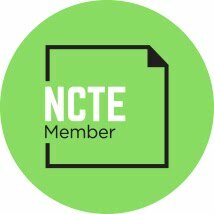 I am so excited that you tried this with Notice and Note! I just finished the book and was thinking of which novel to try it on or to use their example...they give the example for Walk Two Moons in the appendix. 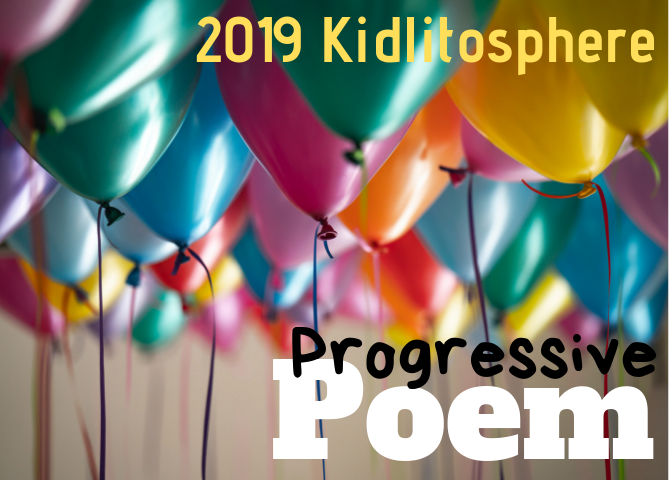 Do you think maybe a few of us could select a novel (that is around fourth and fifth graders) and try to look for the signposts together/discuss? Let me know what you think! Thank you so much for this post! I've been reading N&N and looking for other teachers who have used it on novels - I'm working on War Horse right now. Eager to see other suggestions and successes with N&N! Your post makes me want to put N & N at the top of my TBR pile. :) I love the challenge you gave yourself and think I'll try it myself. I'm going to be doing GRA, so maybe we can connect our classes. Thanks for this great post. Thanks for this post with evidence from the book you read (which has now been added to my goodreads account!). We're reading Notice and Note for our summer PLC. 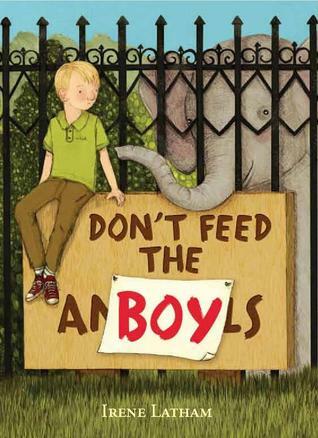 I checked out Don't Feed the Boy twice last year, but never managed to read it. I've now added it to my holds list again. Thanks for inspiring me to apply the signposts in Wonder, a novel that we'll be reading next year.